Experiencing extreme weather is not enough to convince climate change sceptics than humans are damaging the environment, a new study shows. But Americans who lived in areas where a variety of extreme events were recorded—flood, tornado, hurricane, and drought—were ultimately no more likely to share the same beliefs about climate change as scientists. 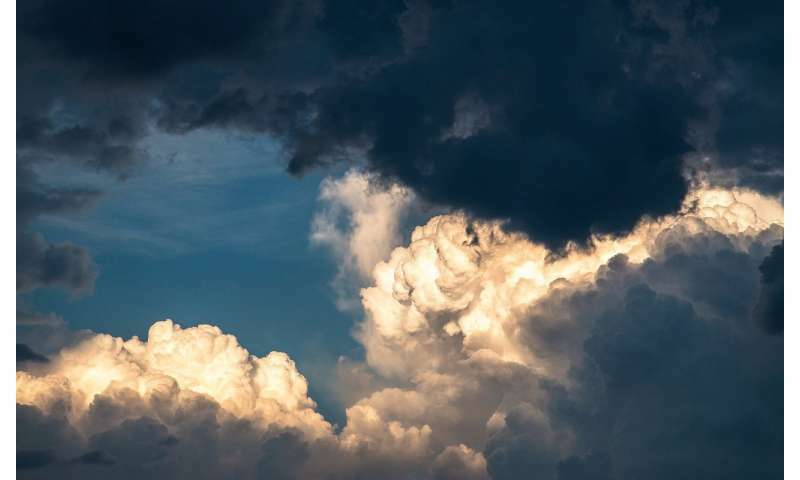 Dr. Ben Lyons, from the University of Exeter, who led the research, said: ""Extreme weather plays a limited long-term role in forming people's beliefs about climate change. Instead, their views and beliefs can alter the way they perceive the weather. We have found when an extreme weather event is ambiguous, as with polar vortex and drought, people are more likely to see the event through a partisan lens. If there is grey area, people are more comfortable applying their preferred label." However the weather can be sometimes so extreme that it overshadows personal views—the researchers found that partisanship and media use did not affect the way people in the American Northeast—where the 2014 and 2015 polar vortex events hit hardest—reported the weather they had experienced. Dr. Lyons said: "Very extreme weather accompanied by constant media coverage is harder for people to deny. But on the other end of the scale, droughts can take longer to have an effect, so people have some difficulty perceiving their onset and this may allow them to bring their biases to the table." Data about the weather was taken from the Storm Events Database compiled by NOAA's National Weather Service (NWS). The data included droughts, floods, tornadoes, and hurricanes.A total of 21.7 per cent of respondents reported experiencing a polar vortex, 41.0 per cent a drought, 19.8 per cent a tornado, 29.3 per cent flood, and 16.7 per cent a hurricane in the past five years. However the data shows 21.3 per cent lived in a county where a flood was recorded over the time period, 25.3 per cent a tornado, 4.3 per cent a hurricane, and 4.4 per cent drought. A total of 59.2 per cent of respondents agreed that "there is solid evidence that the average temperature on earth has been getting warmer over the past few decades." Of respondents who agreed with this statement, 74.2 per cent agreed that the Earth was warming mostly due to "human activity such as burning fossil fuels". Dr. Lyons said: "This research shows people's perception of extreme weather can be processed through partisan lenses. This means efforts to connect extreme events with climate change may do more to rally those with liberal beliefs than convince those with more conservative views that humans are having an impact on the climate. "However, it's important to note that we take a big-picture look rather than focus on specific events. Particularly intense events—a 100-year flood or catastrophic hurricane—might be most capable of influencing attitudes." Enduring Extremes? Polar Vortex, Drought, and Climate Change Beliefs is published in the journal Environmental Communication. The reason why "extreme" weather fails to sway skeptics is because it's weather not climate. The difference between informed skeptics and alarmists is that alarmists think that recent weather has never happened before. Skeptics know that extreme weather has happened many times before. They can point to data that shows that there is nothing unprecedented about current weather and there are no trends showing that weather is worsening. The IPCC acknowledges this in AR5 Chapter 2 - Observations: Atmosphere and Surface, pp.208-217. There are no discernible global trends in the measured data. The fact that alarmists claims of worsening weather still hasn't appeared in the data should be proof that their various theories predicting more extreme weather are wrong, but one should never underestimate the capacity for self-deception of true believers. :" "Very extreme weather accompanied by constant media coverage is harder for people to deny. ........."
Yea it is the constant media coverage that makes it true! It is an affront to science that this person has a doctorate degree. The idea that extreme weather events have not yet appeared in the data or that there are no discernable global trends yet is not just partisan nonsense, its an outright falsehood. I find it ironic in the extreme about your put down of true believers, when you demonstrate you are one of those simple minded true believers who have to make up stuff you probably know is untrue to justify your own blindness. How many consecutive years of 200-1000 year extreme events do you need to see the truth dude? Yup, every weather event is a 1000 year event. Oh wait,,,,,we are not convincing people yet let's call tje next one a 10,000 year event .